Researchers from Africa Check recently went on a search for facts on service delivery protests in South Africa following requests from their followers . There has been wide spread reports that the country experiences no less than 30 protests per day. In their search for facts and accurate information, Africa Check found that there is a limit to the country's service delivery protests information gathering. 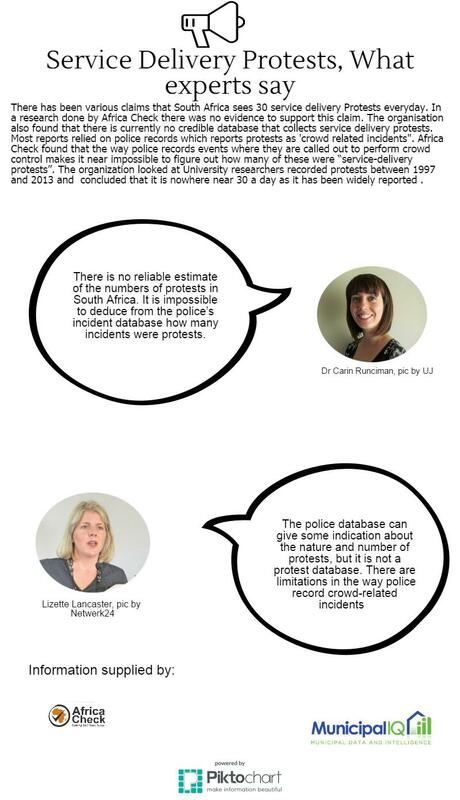 Most reports that claimed 30 such protests daily relied on the police database of "crowd-related incidents". As the organisation found the police's method cannot be used as a credible way of recording service delivery protests. In their research it was found that at the most there is one service delivery protest every second day. The organisation spoke to experts on agreed that there is gaps in information gathering of service delivery protests. Despite what experts say there seem to have been an increased coverage of civil unrest. According to information from Municipal IQ protests actions have increased in the first four months of 2016 as the country prepares for the 03 Augusts local elections. Municipal IQ researcher Karen Heese told Africa Check that last year the organisation recorded a total of 164 protests. When NGO released figures its latest figures this year, already 70 incidents of such protests have been recorded. According to the data from Gauteng, Eastern Cape and KwaZulu Natal provinces had proved to have a high prevalence of civil unrest. Limpopo Province which has seen widespread protests especially in the Malamulele Municipality is among the provinces that have recorded lower rates of service delivery protests.